As the weather changes from cold to warm, you would love to take your furry pal in the open grounds to enjoy and seep in the warmth of sun after the long chilled months. But to our wary, there also arises huge swarm of parasites that are ready to feed on your four-legged friends. This brings in concerns in pet owners to be super cautious and follow different preventive measures in order to protect the furry pals from the dangerous effects of these nasty critters. So, the pet parents are faced with number of flea and tick treatments available in the market. You may be thinking what is the best option to be chosen to protect your tyke or kitty from infestations and aid them to lead a pest free summers. There are numerous Topical And Oral Flea Treatments available on the market. Among the top-notch medications, let’s see the difference between the two most popular treatments to find which one can best suit to your pet. Frontline Plus is highly effective in treating fleas and different types of ticks. The topical solution also eliminates flea eggs and flea larvae. It is a topical treatment. 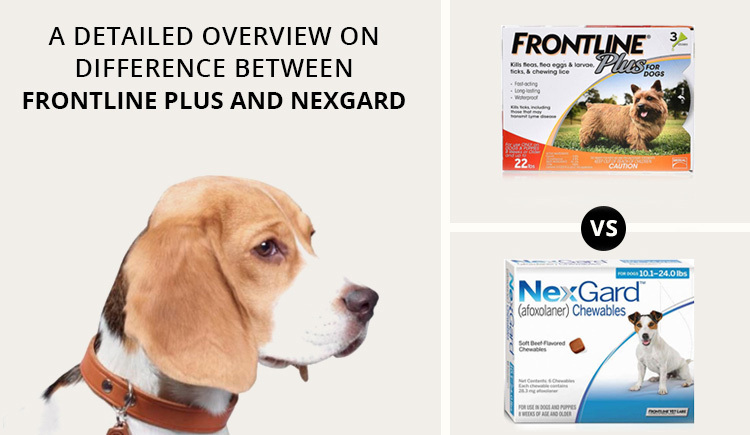 Nexgard is an oral treatment highly used in the prevention of flea and tick infestation. It gives protection without dealing with messy topical. Frontline Plus is developed with two strong ingredients – fipronil and (s)-methoprene. Fipronil attacks the central nervous system of fleas and ticks and is stored in pet’s sebaceous gland after initial application that offer long lasting protection. The other ingredient (s)-methoprene is an excellent insect growth regulator (IGR) which kills flea eggs and larvae disrupting the flea life cycle and decreases the growth of flea population. Nexgard contains the strong acradicide – Afoxolaner, which belongs to the family of isoxazoline. This ingredient affects the nerve cells of the parasite. Prolonged exposure to Afoxolaner leads to induced hyperexcitation, which results in uncontrolled activity of the central nervous system and death of insects and acarines. What age dogs should be treated? 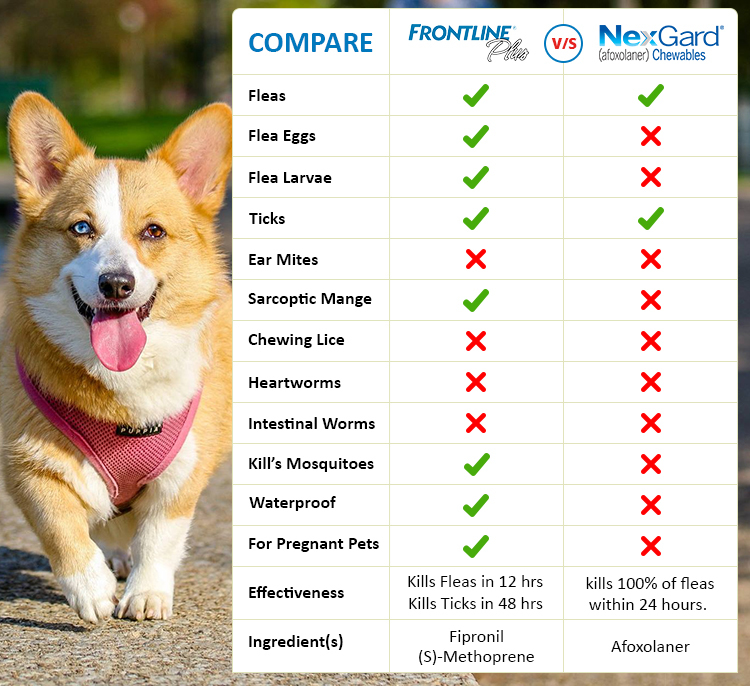 Frontline Plus should be given to puppies above 8 weeks of age. 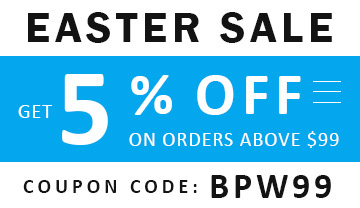 It is safe to use on all breeds of dogs and all sizes of dogs. Frontline Plus is recommended to use on breeding and pregnant dogs as well as lactating female dogs. Nexgard is approved to use in puppies 8 weeks of age and above. It can be given to all dog breeds. Though especially developed for dogs, it is not recommended for pregnant, lactating and breeding dogs. How frequently should be given? Frontline Plus is a topical treatment. Therefore, the solution has to be applied on the skin at an interval of one month. 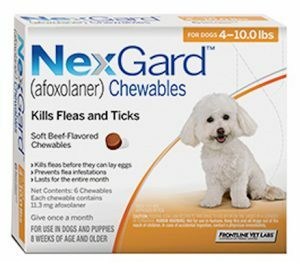 Nexgard is an oral flea and tick treatment. It can be given directly into the mouth or mix it in dog’s food. But, it should be ensured that the whole dosage is taken. Nexgard kills various species of ticks and fleas. The oral tablets destroy Fleas (Ctenocephalides felis); American Dog tick (Dermacentor variabilis); Lone Star tick (Amblyomma americanum); Black-legged tick (Ixodes scapularis); and Brown Dog tick (Rhipicephalus sanguineus). 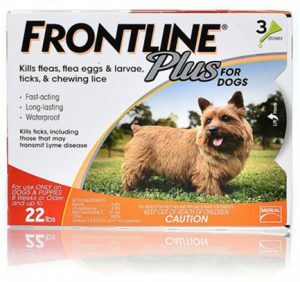 Frontline plus attacks fleas and ticks at different interval of time. It also eliminates chewing lice and ear mites. It kills fleas, ticks including brown dog tick, American dog tick, black-legged tick and Lone star tick. Both the products are highly effective and works against flea and tick infestation without any major side effects. According to your vet’s recommendation and which product best suits your pet, you need to make a choice. Pet’s health is always important therefore, always check with all the minute details before buying any product.